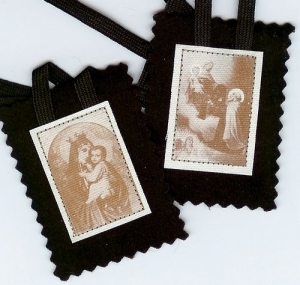 The Carmelite Brown Scapular is a piece of cloth worn by members of the wider Carmelite Family as a devotional object signifying their love for Our Lady, the Blessed Virgin Mary. The Carmelite brown scapular is worn by hundreds of thousands of people around the world as a 'sacramental' object of Marian piety, and Pope Pius XII placed it 'in the first rank of Marian devotion' alongside the rosary. The scapular symbolises the special dedication of Carmelites to Mary and expresses our trust in her motherly protection, as well as the desire to emulate her commitment to Christ and to others. As a garment it is a visible sign representing the spiritual bond between all those who wear it in Mary's honour. It is a symbol of belonging, bringing all wearers into the one great spiritual family of Carmel, sometimes called the Brown Scapular Confraternity. The scapular says something more, since it appeals to Mary's power of intercession. The scapular devotion claims that all those who honour Mary and who take her as their guide and inspiration will have her assistance in life and death. 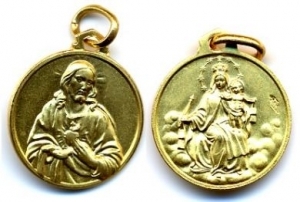 The miniature scapular that is worn by many thousands of people around the world is a reduced form of the religious habit that Carmelite friars and nuns wear. The purpose of a scapular in a religious habit is to be an apron protecting the wearer's clothes. Therefore a scapular is also a sign of service, of 'going to work' for God's kingdom. A popular practice encouraged by the late Carmelite friar Fr. 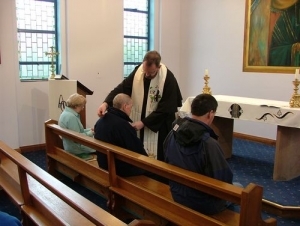 Malachy Lynch, is to say "Mary, use me today", as the scapular is put on each morning. Pious legends - historically inaccurate but imbued with spiritual truths - claim that the brown scapular was given by Our Lady to an early Prior General of the Carmelite Order, Saint Simon Stock, either at Aylesford Priory or in Cambridge. Sadly for many years the scapular was associated with superstition and a complex historical development that led to misunderstandings. Promoters of the scapular used to speak of the so-called 'Sabbatine Privilege' which claimed that those who wore the scapular would be saved from Purgatory the first Saturday after their death. The Church and Carmel no longer speak in these terms, but seek to reclaim its true spiritual significance. To watch a video presentation about the Carmelite Brown Scapular, click on the arrow in the YouTube box below. For more information about the Scapular, its symbolic meaning, and enrollment, please contact one of the Carmelite communities listed on the communities map of this website.